Katmai: Alaska's Wild Peninsula re-aired December 2016. A narrow frontier between warm and cold latitudes extends 500 miles south and west from the Alaskan mainland, separating the tempestuous Bering Sea from the Pacific: the Alaska Peninsula, a cloud-cloaked landscape so remote it is accessible only by air or water. In Katmai - Alaska's Wild Peninsula, filmmaker John Grabowska (Ribbon of Sand, Sky Island) presents a rugged frontier at the ends of the earth, a land where bears outnumber people and the sockeye salmon run is the most prolific in the world. The mostly treeless peninsula endures a maritime climate described as "notoriously miserable": long winters, cool summers, frequent storms and sudden bursts of wind called williwaws — so fierce, bush pilots say, they can rip the numbers off a plane. 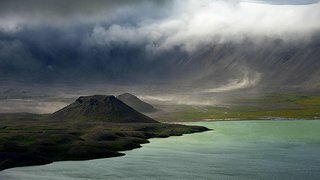 Aniakchak was once a stratovolcano that exploded 3500 years ago. Courtesy of Roy Wood. The Aleutian Range, part of the Pacific Ring of Fire, comprises the spine of the Peninsula, with 20 active volcanoes rising above the glacier-carved fjords of the Pacific Coast. Near the base of the Peninsula lies Katmai National Park, a wilderness larger than Yellowstone and Yosemite — combined. Katmai was established after the largest volcanic eruption in the 20th century, 1912's Novarupta, resulted in the creation of what came to be called The Valley of Ten Thousand Smokes. Explorers thought they had discovered "a new Yellowstone", but the ten thousand smokes slowly vanished as the heated groundwater vaporized. Today's valley is a stark, beautiful moonscape of ash fields ringed by volcanoes and favored by backpackers. Adventurous visitors are also drawn by brown bears, which gather in large numbers and in remarkably close proximity at Brooks River for the sockeye salmon runs. The bears have become habituated enough to the presence of people and are so focused on feeding on salmon that Brooks Falls is famous the world over for its bear viewing opportunities. Because of the abundance of food sources, the bears grow to unusual size and are larger than interior grizzlies, the same species. The true keystone species in Katmai and on the Peninsula, however, is the sockeye salmon, Oncorhynchus nerka, also called the red salmon for the intense color of its flesh. Not only does the sockeye sustain the population of the brown bears, it brings nutrients from the open ocean to the Alaskan landscape. Sockeye DNA has been found in trees ringing the lakes and rivers of the Alaska Peninsula. Farther down the peninsula a giant volcanic caldera emerges on the horizon, so remote that more people climb Everest than visit Aniakchak National Monument. Aniakchak was once a stratovolcano that exploded 3500 years ago and then collapsed upon itself, an eruption far larger than Novarupta. Even this distant land has felt the touch of industrial society. Lingering oil from the Exxon Valdez can still be found in the beaches of the Katmai coast, more than 450 miles away from the 1989 spill. Dissolved fall-out from burned fossil fuels is preserved in glaciers, which are flushing into the ocean in a colossal meltdown. Climate change is warming Alaska and the Arctic far faster than much of the rest of the world, with sea level rise, melting permafrost and retreating glaciers. Katmai - Alaska's Wild Peninsula explores the ends of the earth and asks how climate change effects will impact this magnificent land of wilderness and wildlife. John Grabowska and Idaho Public Television. © 2015 Idaho Public Television. All Rights Reserved.